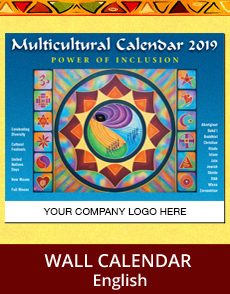 The 2019 Multicultural Calendar is titled "Power of Inclusion." Inclusion and diversity today encompasses all communities, countries and regions of the world. Patterns of migration, urbanization and technological changes have led companies to include more collaborative ways to respect, value and facilitate teamwork in the workplace. Inclusion is a conscious choice to respect diversity and maximize its economic, social, cultural and civil benefits, locally and globally. The 26th edition continues to grow in popularity with corporations, universities, banks, hospitals, social service agencies and the government. 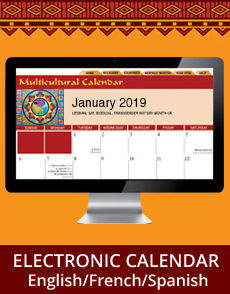 This unique and informative 2019 Diversity Calendar incorporates hundreds of multifaith, multicultural and diversity related holidays and observances. Compatible with Firefox, Internet Explorer, Safari and Chrome. 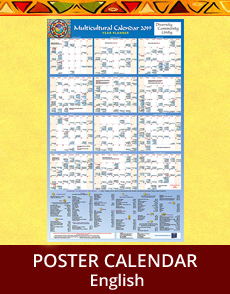 Accurate dates with explanations for each of the world's twelve major religions and the cultural festivals of most ethnic groups in North America. Religions: Aboriginal Peoples, Bahai, Buddhist, Christian, Hindu, Islam, Jain, Jewish, Shinto, Sikh, Wicca and Zoroastrian. 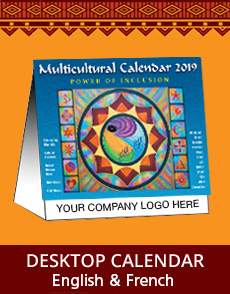 Cultural Festivals of over 140 countries including Afro Canadian/American, Australia, Bangladesh, Brazil, Caribbean, China, Denmark, United Kingdom, Egypt and many more.